When my dog, Ricochet was born, I wanted her to be a service dog for a person with a disability. 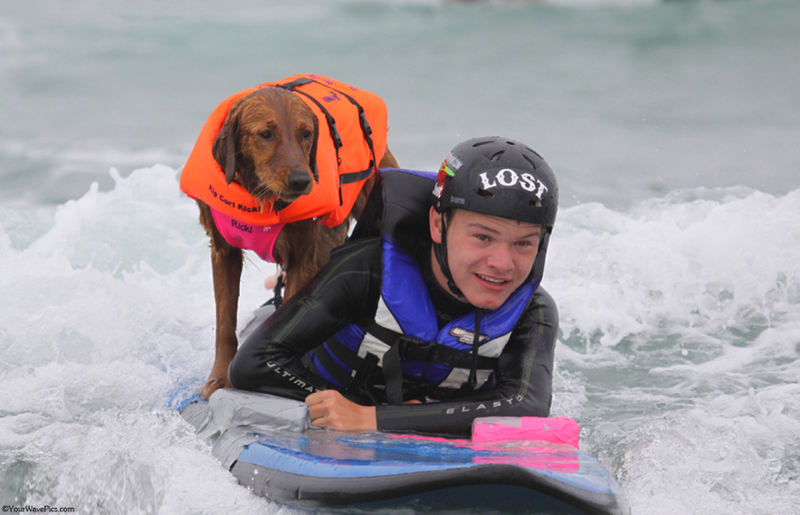 But, one day on the beach, she jumped on a surfboard with 14 year old, Patrick Ivison who is quadriplegic. 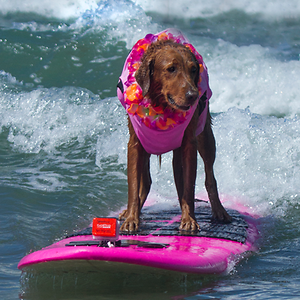 I guess she thought I said SURFice dog®! Despite my expectations, she stayed true to herself. Once I listened to her, she was able to help people in ways I never imagined possible. 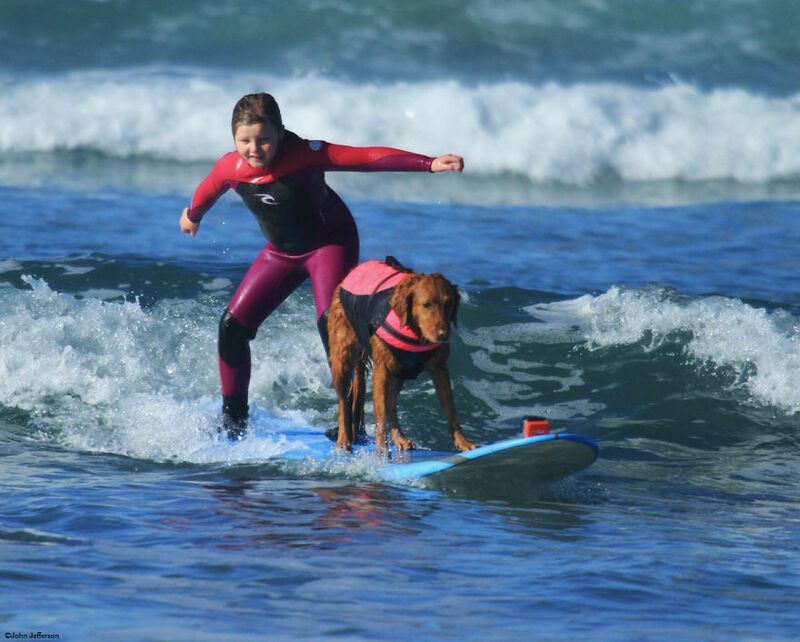 For the last six years she’s been surfing with people with disabilities, kids with special needs, wounded warriors and veterans with PTSD as an assistive aid and intuitive muse. And, because I nurtured her natural tendencies, she has developed an extraordinarily powerful ability to make immediate, deep, heart-to-heart connections with the individuals she interacts with. She intuitively and empathically alerts to their emotional and physical changes which allows for profound paws-on healing interventions. 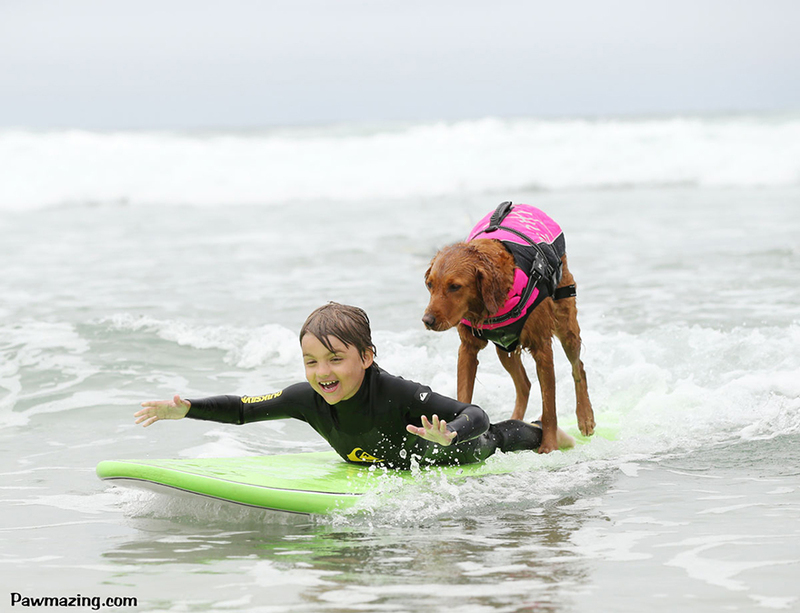 As a result, she balances boards… and balances lives! Jill lost her leg to cancer, but that doesn’t stop her from being active! She uses Ricochet’s back as stabilizer to stand up. Once she’s up, she can let go! 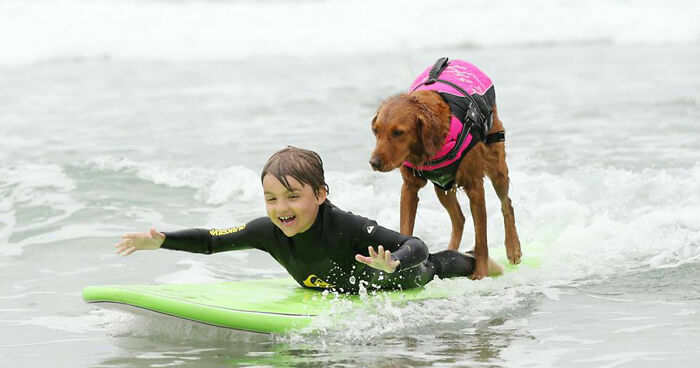 Gina has autism, her self confidence has soared since surfing with Ricochet. 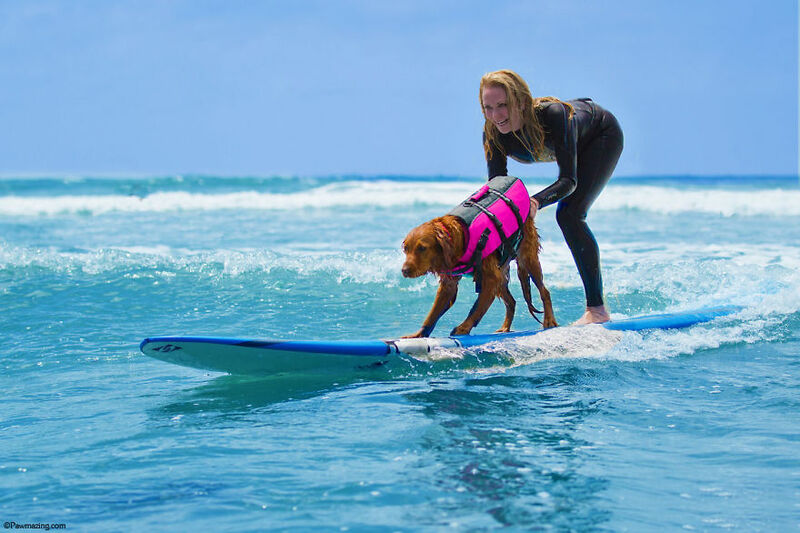 She now owns her own surfboard! Sabine posted on Ricochet’s facebook page asking if a woman without arms could surf. I guess you can tell how Ricochet responded! Caleb saw Ricochet surfing with kids on ESPN. When Make-A-Wish asked what he wished for, he said to surf with Ricochet. Sadly, six weeks later Caleb lost his battle with brain cancer. But not before he touched all our lives. Ricochet has an incredible sense of empathy and often mirrors the military service members with PTSD, alerting to their anxiety, pain and other symptoms. As such, she can help people go inward to find a place of peace while, at the same time, moving outward through their greatest fears. Ricochet has provided a spectacular example for what dogs can do to help those among us who need just a little extra love , please push the up button so she gets some more recognition. Thanks Eugene, we are trying to raise more awareness of what dogs are capable of! Ricochet is a hero and helps so many people! Wonderful! !